This is my second post of the day, earlier today I posted a card depicting Little Red Riding Hood. I make no secret of my affection for Teddy Bo and his friends, particularly Jolly and Olifant. So I jumped at the opportunity to portray Olifant as Dumbo. 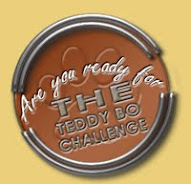 This Teddy Bo and Co image is called Olifant Smiles. 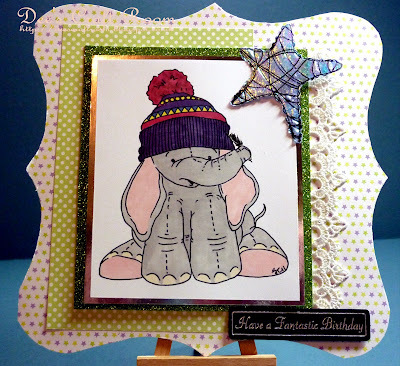 After colouring Olifant with Promarkers I mounted him on silver mirri and green glitter card. The papers are by Dovecraft and the lace trim is from Wild Orchid Crafts. I made the wrapped star by sandwiching some Angelina Fibers between two layers of Fantasy Film and ironing then onto the star stamp using my encaustic art iron. 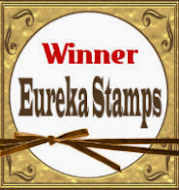 The Wire Art Star stamp is from Clarity Stamps. Thank you for dropping by, please come back soon. OMG, another shocker! Second card of the day again! You are on card making fire (LOL). Love your Dumbo II. He is coloured in gorgeously as usual. Also what caught my eye is your beautiful lace and that star made out of Angelina fibers! Stunning embellishment!